There are certain things we associate with different times of year. Starbucks made sure we knew that a pumpkin spice latte is synonymous with Fall, and there are a myriad of holiday-themed songs that make sure we know what Christmas-time holds in store. Toasting nuts by the fireplace, gathering with loved ones, and keeping an eye out for Santa. While we need to keep warm regardless in the winter, it doesn’t hurt if the fire just so happens to fit your sensory memory of what you expect as well. There are many spiced and woody smells that come to mind during Christmas, and the Wax-Bottom Pine Cone Fire Starters have all that in one. If the title doesn’t give it away, they’re pine cones that will help jump-start some flames. 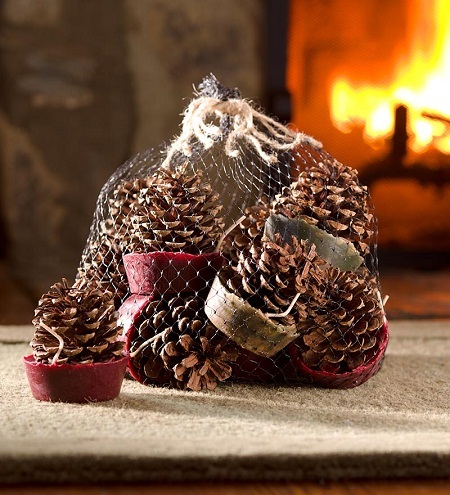 These are not only decorative when not in use, but are made of pine cones that have been set in a wax and sawdust base. There’s a wick to get this little thing going, but before you know, the fire will be going in no time. This would likely add at least a small aroma to your fire, and they come in a pack of twelve. It will certainly fit the holiday aesthetic in your home, or could make for a decent gift. Truth be told, if you’re in an area that has an abundance of pine cones, you may as well recycle the wax from old candles, use dried pine needles, and make your own version. Cheap and efficient, though buying these will save you the time it would take to make them by hand.